*If you are renewing your subscription, please confirm you are logged in, then click on Sign Up Now below. The WilsonDailyPrep program provides students with the reinforcement they need to learn the necessary skills and strategies for SAT and ACT success. 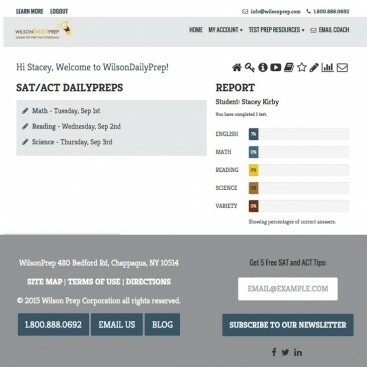 Students are emailed a daily SAT / ACT quiz. Quizzes take only a few minutes to complete, enabling even the busiest student to fit the DailyPrep into his/her day. Studies show that daily, consistent practice is one of the most effective ways for students to achieve their academic potential.